Located on Florida’s west coast in Bradenton, Beavertail Skiffs, has been quietly building some of the very best shallow water fishing skiffs and flats boats on the planet. Through consultation and real-world R&D with some of the very best and seasoned guides in the shallow water industry, Beavertail Skiffs are engineered and built with zero compromises and advanced technology which offers the very best in value, performance, quality and durability. 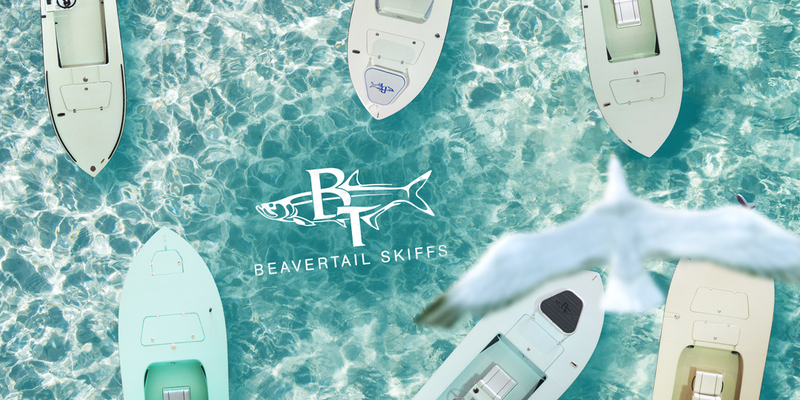 As Beavertail’s agency partner, we’ve been instrumental in re-vitalizing their visual brand and messaging – helping to position them at the forefront of the shallow water skiff market. From performing a comprehensive brand audit to completely revamping Beavertail’s website and online presence, we’re helping to bring their branding and marketing to a level that matches the stellar quality of the custom skiffs they produce, through strategic marine industry marketing strategies. #BTSkiffsLifeIsGood! Quality Skiffs Need a Quality Brand…That’s Where We Come In! Building a quality product line of skiffs and flats boats – then not having a visual brand and marketing collateral with a strategy to match – doesn’t jive. That’s exactly where we come in! Working closely with Liz and Will at Beavertail Skiffs, our Team performed an overall brand audit and identified what was working, what wasn’t, and the direction we needed to take their brand and voice. The result was a completely updated look and feel for the boat company, new marketing collateral and the development of a highly-polished website, which has received rave reviews from Beavertail customers! The feedback we have had for the website since we launched it has been fantastic – people genuinely feel they know us before they pick up the phone. The attention to detail, new color choices, and page layouts that Thrive worked so hard on really give our customers a sense for the kind of quality we provide when they order a new skiff from Beavertail Skiffs. Even more, we were impressed with the level of communication and service we received from Thrive. As one of our largest boat shows of the year approached – the Miami International Boat Show – they made us feel like we were their top priority and helped us make the show a HUGE success! Beavertail Skiffs has a long-standing and recognizable logo, which we felt strongly about keeping intact – with a bit of polishing. In addition, the color palette for the company was in need of a refresh and revitalization. We cleaned up the existing logo and introduced a new color standard for the overall brand, which supports their target audience, works well with their product line and aligns with the new collateral we’ve developed. A New Product Brochure: Welcome to the Family! Passionate skiff anglers labor over their decision when it comes time to purchase a new whip. And we wanted to help folks along in their decision-making process by providing a quality brochure piece which highlights the seven skiff and flats boat models offered by Beavertail. Beautiful photography, the right amount of story and the info anglers need to make educated choices are the hallmarks of the new piece. For each model of Beavertail’s skiff and flats boat line, we created individual product slicks and housing folders. These clean, informative pieces are important pieces for use at boat show events, demo days and for those who visit the Beavertail Skiffs factory for the full tour! You Just Have to Look Great at Boat Shows! You do. You have to look great at boat shows. It can be the difference between a crowded show space and folks just walking on by…. For Beavertail, we developed show backdrops, banner stands and show marquees highlighting each boat model. And, if Miami International Boat Show was any indication of the impact we’re having, let’s just say there are lots of good things to come for Beavertail Skiffs!